What is a rain barrel? Can I use rain water collected from my home's downspouts on my landscape plants? Rain barrels are a great way to conserve water, save money, and grow healthier plants. Their popularity is increasing because they're such an easy way to take the rain water that falls on your roof and collect it for use on your garden and container plants. Rain barrels are easy to make or you can buy one from the rapidly growing number of vendors that offer them for sale. The way rain barrels work is simple: you hook them up to one of your downspouts to collect roof run off when it rains. The barrels have a faucet at the bottom that allows you to access the water whenever you need it. The benefits for your plants include the free use of water for irrigation that is free of chlorine, fluoride, salts and other harmful minerals as well as being soft and oxygenated. During times of drought and city water restrictions, you have a stored supply of water until the next rainfall. Finally, you get the knowledge that you're doing something to help our planet. 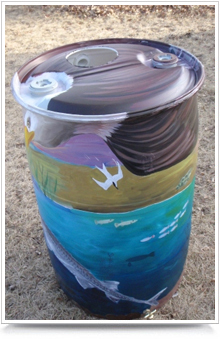 This rain barrel, showing faucet and overflow pipe was painted for the city of Lincoln's Artistic Rain Barrel Program by the following members of the Great Plains Chapter of the Guild of Natural Science Illustrators: Michelle Hansen-Daberkow, Jessica Kelling, Karina Helm, Andrea Faas, and Lana Johnson.